The Family Matriarch Award is given to a senior member of the family who’s life has transcended the limitations placed on them. This award is an award of pride. It is designed to allow the recipient to know that we are proud of their contributions to this family and to the world. It was formed as a result of the committee realizing that we need to honor our seniors and revel in their respect and love. It was created to allow us all to see what excellence looks like. The Family Matrirachial Award represents the best that we have to give. 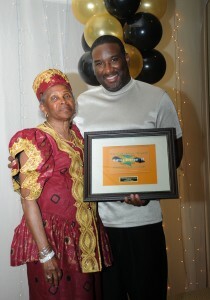 It is given out of pure respect for the honoree and our devotion to our elders. It is an award of strength in that we acknowledge that the honoree has allowed the younger generations to stand on their shoulders and rise to meet our potential on this planet. And it is an award of love, in that love is the purest form is admiration and admiration is the closest expression of God’s happiness. This years winner of the Family Matriarch Award is a family favorite. She was born in Jamaica in 1928. She is the mother of 6, and the grandmother and the great-grandmother of many here today. She lived in both the United States and England. She came to America to make her mark on the fashion industry. As such she worked in some of the most fabulous fashion houses in the world and was the lead seamstress for many modern designers and the House of Yours Truly. She was a style maker and trend setter and is know for her short shorts and mini-skirts. This years winner always has a positive word of encouragement to give you and the love that she has for this family is unconditional and uncompromising. She is the fabric of the Huntley Clan and continues to weave the magic of her love wherever she goes. We live our lives in honor of her and we hope that she knows that her life and her legacy has been a blessing to us all. In the purest form of all, we thank her for being a perfect example. We can think of no one who deserves this honor more that the 2010 recipient Veronica “Aunt Ninny” Neunie.